It’s not always easy to lose weight and make smart diet choices — especially if your kitchen is filled with traps that throw you off course. 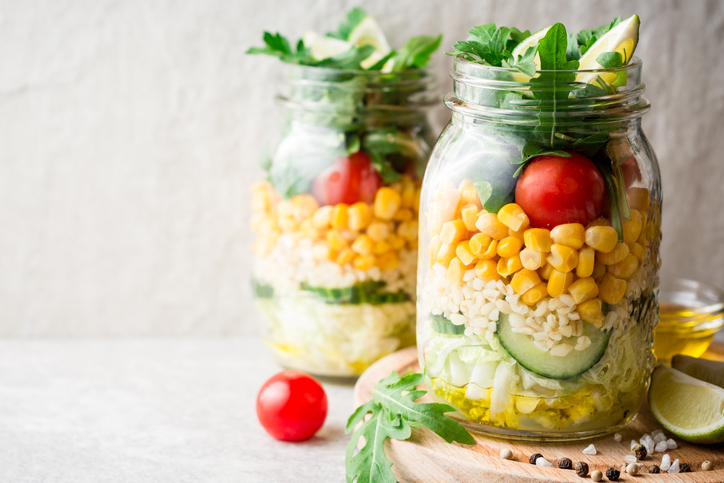 But a few minor changes to your kitchen’s organization and function can make a huge difference if you’re working to reach and maintain a healthy weight. Try these seven tips in the kitchen that can help you lose weight and stick to a healthy diet. 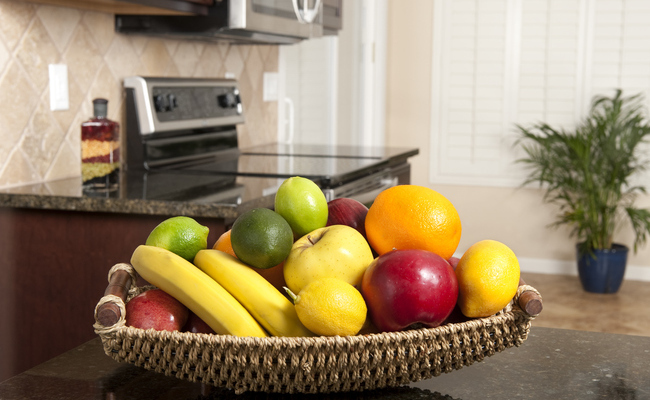 Put healthy foods front and center, so you’re more likely to grab them than junk food. And know your trigger foods — i.e., unhealthy foods that make you want to overindulge. Either store them out of sight (and hopefully out of mind), or don’t even bring them into the house. Instead, make sure you have all the ingredients for a healthy snack or meal on hand and readily accessible. (Your organizational system should let you know when you’re running out of something.) Cleveland Clinic even recommends storing foods that you eat together, such as carrots and hummus, in the same spot. This way, they’re as simple to grab and eat as a bag of potato chips. Take a page out of Marie Kondo’s book, and declutter your kitchen and dining space. According to a study published in the American Journal of Clinical Nutrition, distractions — such as clutter, smartphones, TVs, etc. — can lead to overeating at a meal. And they even can cause you to consume more food later on because your memory of eating isn’t as strong as it would have been if you were paying better attention to your meal. So Mayo Clinic recommends decluttering your dining space and setting it up for, well, dining. Make it a spot where you can sit down and focus on your food without paperwork, screens or general untidiness calling for your attention. “You’ll be able to better listen to your hunger and fullness cues, which can help you avoid overeating,” according to Mayo Clinic. You also might want to pre-cut fruits and veggies into individual portions, so they’re easier to grab and go when you want a snack. And if you’re using condiments or spreads, scoop out the correct serving size in advance, rather than continuously adding them to your food as you eat. If you’re not sure what the proper portion is, there are many online nutrition databases that can help. Or you can consult your doctor for more individualized advice on the best diet strategy for you. Allow yourself one reasonable portion to begin. Then, slowly finish what’s on your plate before considering whether you need (not want) more. You even can make it a slight hassle to get more food by putting everything in storage containers (allowing hot foods to properly cool) right after you plate your first helping. You also can try eating with your nondominant hand — or even using chopsticks — to avoid mindlessly shoveling food into your mouth. Take your time. Strike up a conversation if you’re eating with people (or pets — no judgment here). And enjoy the food. By not rushing, your brain will realize it’s full after you’ve eaten an appropriate amount. Because thirst can feel similar to hunger, staying hydrated can help if you’re trying to lose weight — not to mention hydration is vital for anyone’s health. But drinking too many calories can easily throw off a diet. “You’re better off quenching your thirst with water than taking a swig of juice when you’re thirsty,” Cleveland Clinic says. If you have trouble getting yourself to drink enough plain old tap water, try keeping a pitcher of filtered water in the fridge. Even better, Cleveland Clinic suggests making your own naturally flavored water using foods, such as mint, lemons or cucumbers. Find the flavor that makes you want to hydrate, and always have a pitcher prepared. If you tend to eat out more often than you cook at home, you might be sabotaging your health (and your wallet). 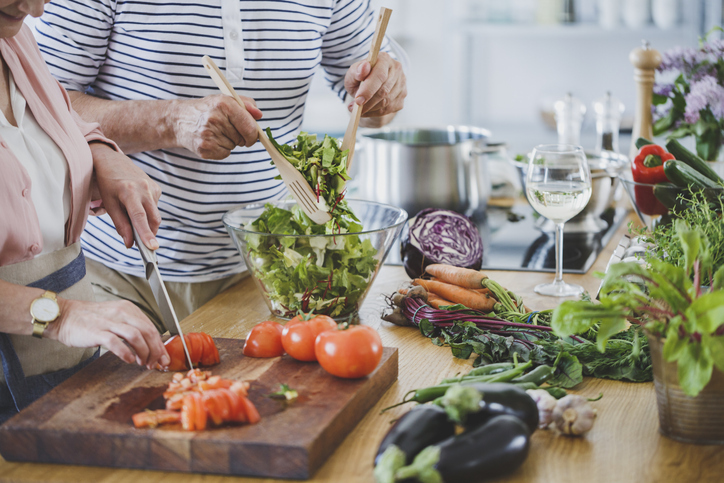 “More frequent consumption of home cooked meals was associated with greater likelihood of having normal range BMI and normal percentage body fat,” according to a study published in the International Journal of Behavioral Nutrition and Physical Activity. Plus, study participants who ate home-cooked meals more than five times per week consumed more fruits and vegetables compared to those who ate at home fewer than three times per week. So make your kitchen a place where you like to spend time cooking. That might mean decorating it to your taste, investing in some nice cookware or simply better organizing what you have. If you’re not much of a chef, consider taking classes or finding some easy recipes online for inspiration. When you set up your kitchen for nutritious cooking, you’re giving yourself the tools you need to lose weight and maintain a healthy diet. 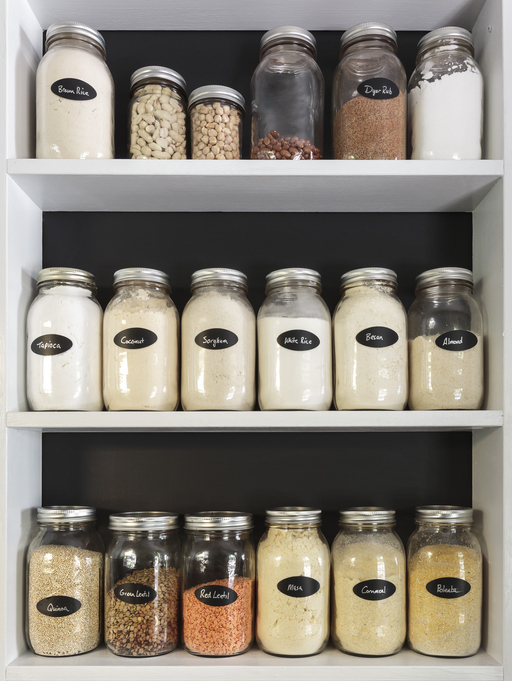 The glass jars shown do not have any best by dates on them, which are a major help in knowing what needs to be used next and in stock rotation. If you take all the items that make people like sitting down in a space, away, the people won't sit there any more. The teens will sit in their room where they can listen to music while eating. Not all of that makes sense. Hummus needs to be stored in the fridge, carrots do not. If you pre cut veg they may start to go off.